Our latest guest blog is from TBAT Innovation all about R&D within the Food and Drink Industry – take a read! Some of the current challenges facing the sector include reducing environmental impact, meeting growing global demand for food and creating new products to meet diet and health requirements. These challenges allow for a constant stream of innovation and R&D within the sector! 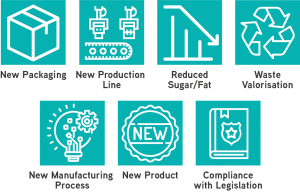 Whether you are developing smart packaging to reduce waste, integrating new manufacturing processes and machinery, or making new/improved ingredients or products which also comply with legislation and regulation; all these things are considered R&D. The UK government understand that R&D is a contributor to the UK economy, and that businesses innovating means that the economy will continue to grow! Businesses can be rewarded for this by claiming R&D tax credits. Some food and drink businesses may not even realise that their ‘every day’, ‘run of the mill’ development and changes are classed as R&D and therefore can claim R&D tax credits as relief to off-set some of the costs they have incurred by developing and implementing these new processes, products and by working on solutions that ‘solve a technical problem’. TBAT work with many food and drink companies, helping them access grant funding and R&D tax credits alike. By working within this sector with disruptive and innovative businesses, we have become experts in identifying eligible R&D activity – some examples are below. For one of our food production clients, who were working on new product development, new processes adhering to food safety regulations, safe food product research and new stock and handling process software, we were able to help them claim back in excess of £480,000 in R&D spend! That included over £233,000 in labour costs, over £223,000 in materials, and over £30,000 in other costs eligible for the claim. These totals were within only one tax year! 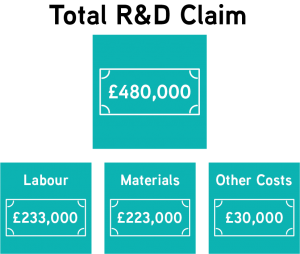 When making an R&D Tax Credit claim, you can go back 2 financial years, if you have not claimed already – how much have you spent on R&D in the last 2 years, that you haven’t claimed back?